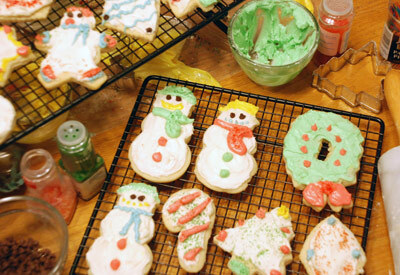 Cut out Christmas cookies are a holiday tradition and this recipe is extra good. Cream sugar, shortening and butter or margarine until fluffy. Add egg, milk and vanilla; beat well. Stir together flour, baking powder and salt; stir into creamed mixture. Cover and chill at least three hours. Working with half of the dough at a time, on a lightly floured surface roll to about 1/8- inch thickness. Cut with cookie cutters into desired shapes. Place on ungreased cookie sheets. Bake until set but not browned, about 7 to 8 minutes. In a large bowl with an electric mixer at low speed, combine sugar, butter, milk and vanilla. Beat at medium speed 1 to 2 minutes until creamy. If desired, add more milk until frosting is of spreading consistency. The way I do it... I stir all the ingredients by hand (the creaming of the shortening and all). And...really important...I do not chill the dough. I use a little bit more flour to dust the surface when rolling the dough, and I probably roll the dough out a teeny bit thicker than 1/8-inch (maybe 3/16 to 1/4 -inch). The most important thing is...don't wait until the edges brown to remove them from the oven. They are done when they puff and lose some of their sheen. The bottom will be slightly golden, but the edges will not look brown at all! Good luck!